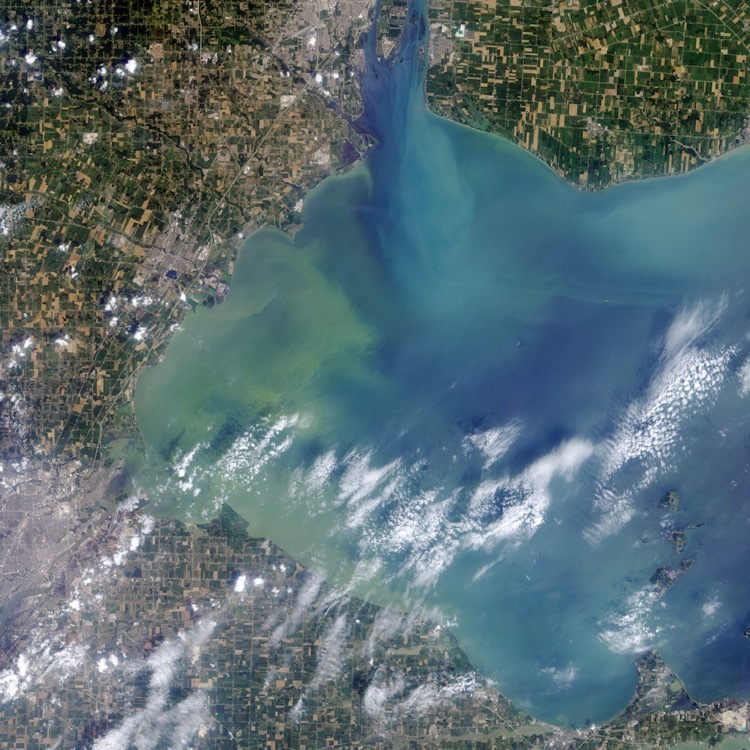 Throughout this summer and fall, the U.S. coastline has been hit with a wave of harmful algal blooms (HABs). IOOS Regional Associations (RAs) are developing new tools to predict HABs events. While harmful blooms now affect most regions of the country, the blooms vary from region to region meaning there is no one-size-fits-all solution. The regional structure of IOOS allows for each RA to tailor its approach to the regional capacities, unique environmental conditions, the HAB taxa responsible for blooms, and the needs of the stakeholders. IOOS regions work with federal, tribal, state, academic and other partners to identify the requisite observations, forecast models, data management, and communication. The IOOS Ocean Technology Transfer Project, a competitive grant program designed for emerging technologies has deployed Environmental Sample Processors and Imaging Flow CytoBots in several regions. These new technologies promise to enhance detection of HABs in near real-time and to provide early warnings of harmful events. 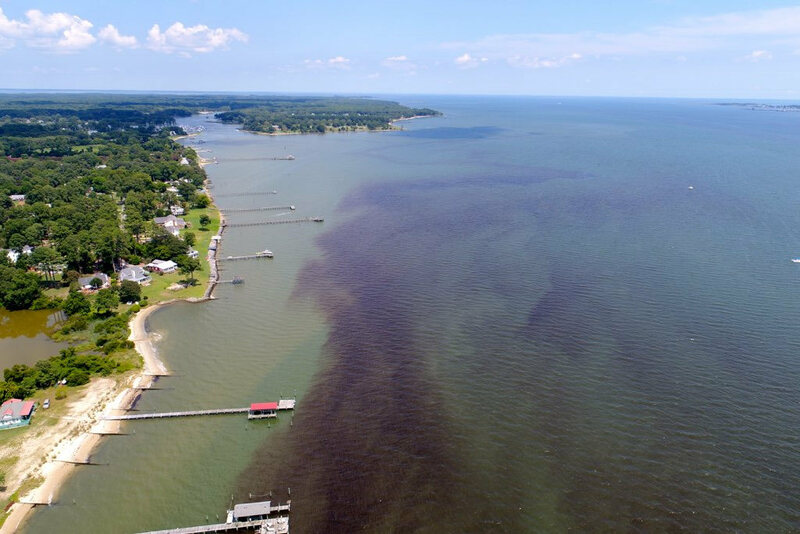 Read on for highlights of RA initiatives to address harmful algal blooms. The major concern in Alaska is blooms of Alexandrium that can cause Paralytic Shellfish Poisoning (PSP). While the State of Alaska monitors blooms for commercial harvest, no formal monitoring plan exists for the extensive recreational and subsistence harvesting of shellfish. The Alaska Ocean Observing System (AOOS) is one of the coordinators for the Alaska HAB network (AHAB) that brings together a number of regional efforts with the goal of developing statewide monitoring. AOOS aids with coordination, data management and observations, including a new monitoring effort in the Arctic. Improved monitoring will improve the predictive models that will provide managers and harvesters information about blooms. 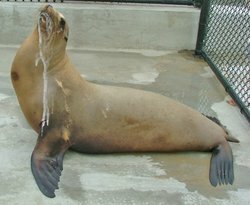 The Northwest Association of Networked Ocean Observing Systems (NANOOS) works with a variety of partners to improve the detection and forecasting of Pseudo-nitzschia blooms that can produce domoic acid, a marine biotoxin that is responsible for shellfish harvest closures and marine mammal deaths. 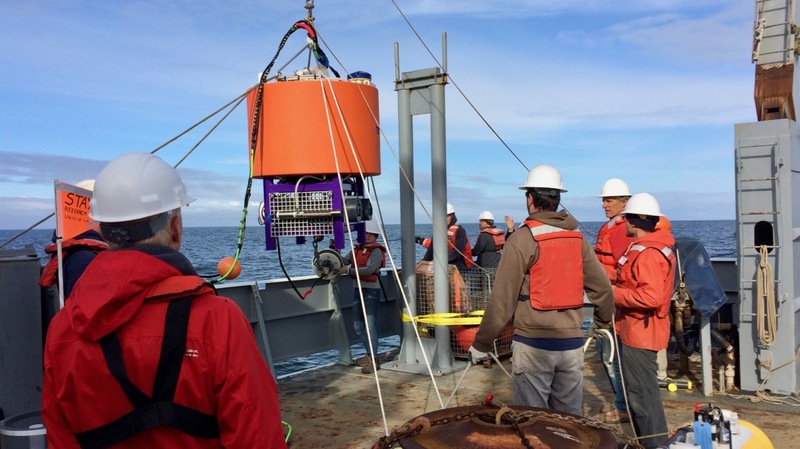 To better understand coastal dynamics, the University of Washington and NANOOS deployed the Northwest Enhanced Moored Observatory (NEMO) mooring in the Juan de Fuca eddy, a known HAB genesis site. In 2016, the Northwest Fisheries Science Center added an Environmental Sample Processor (ESP), or a ‘lab-in-a-can’, to the mooring with support from the IOOS Ocean Technology Transfer (OTT) Project. The ESP uses specific molecular assays to detect Pseudo-nitzschia and domoic acid in near real-time. The data along with contextual information are displayed on the NANOOS website and are important inputs for NOAA’s Pacific Northwest HAB Bulletin. A volunteer uses a smartphone microscope to measure the abundance of K. brevis in a water sample. Karenia brevis threatens the five states in the the Gulf of Mexico. Also known as red tide, it is responsible for contaminating shellfish and for massive mortalities of fish, marine mammals, and sea turtles. K. brevis also causes respiratory distress in people, especially for those who have asthma. Two very different types of HABs affect the Caribbean: ”golden tides” caused by large aggregations of the seaweed Sargassum in coastal zones and Ciguatera Fish Poisoning (CFP), endemic to tropical areas. 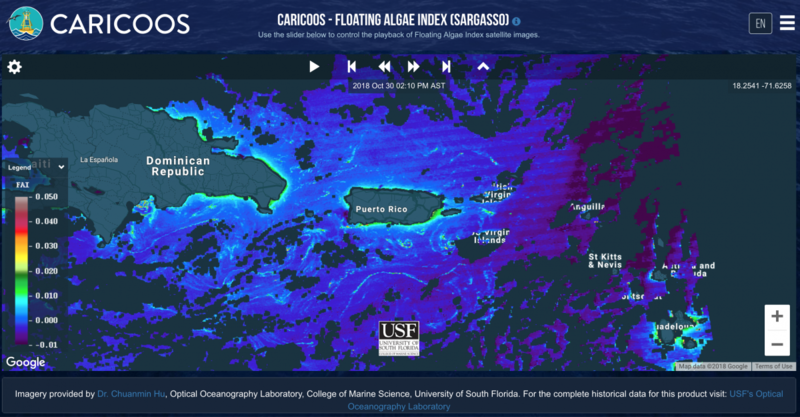 The Caribbean Coastal Ocean Observing System (CARICOOS) publishes daily imagery of the floating Sargassum in the region using the Alternate Floating Algae Index developed by University of South Florida. An ongoing effort using high-frequency radar (HFR) for surface current measurements is aimed at forecasting short-term Sargassum beaching events when significant concentrations are detected offshore. CARICOOS has also been a key player in the research for understanding the environmental causes of CFP. Currently, there is an unprecedented and persistent HAB impacting both coasts of Florida. Karenia brevis (commonly known as red tide) creates a toxin that is threatening to organism health. The Southeast Coastal Ocean Observing Regional Association (SECOORA) supports observing and modeling work to track the bloom. SECOORA is working to more broadly share data resources on red tide here. SECOORA supports ongoing modeling work at the University of South Florida’s (USF) College of Marine Science to help forecast HABs. The USF model provides short-term (4.5 day) HAB trajectory forecasts for the west coast of Florida. This work relies on observations of oceanic and atmospheric conditions to get the forecast right. The HAB trajectory modeling is conducted by Dr. Bob Weisberg and his colleagues at USF in partnership with Florida Wildlife Commission. In addition, SECOORA and GCOOS have worked with Mote Marine Laboratory and partners at NOAA and NASA to design a user-friendly app that provides beach condition reports from select beaches on the southwest coast of Florida and the Florida Panhandle. The app alerts users of fish die-offs, respiratory irritation among beachgoers, water color, wind direction, and what flags are currently flying at beaches (for lifeguard-monitored beaches). Harmful Algal Bloom streaks. Image Credit: Donglai Gong, Virginia Institute of Marine Science. While some blooms occur in the spring, the most noticeable HAB events in the Mid-Atlantic come during the late summer and early fall. Species such as Raphidophytes can cause possible harm to humans, and Alexandrium monilatum are harmful to shellfish and finfish. 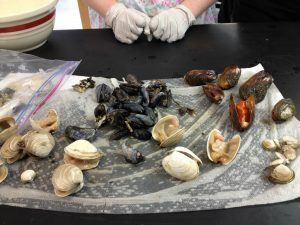 HAB-related human shellfish poisoning illnesses common in other regions are also seen in the Mid-Atlantic, such as Paralytic Shellfish Poisoning (PSP), Amnesic Shellfish Poisoning (ASP), and Diarrhetic Shellfish Poisoning (DSP). The Mid-Atlantic Regional Association Coastal Ocean Observing System (MARACOOS) acts as a regional hub for scientists and government officials to connect and collaborate on HABs initiatives. A proposed collaboration seeks to improve HAB monitoring, forecasting, and response capacity in the Chesapeake Bay. The project will improve HABs model forecasts using real-time observational data. This will build off previous work that constructed models predicting the relative abundance of several species of HABs by assessing environmental conditions. MARACOOS will engage with coastal managers throughout the duration of the project to ensure that data products can be successfully applied to coastal management. 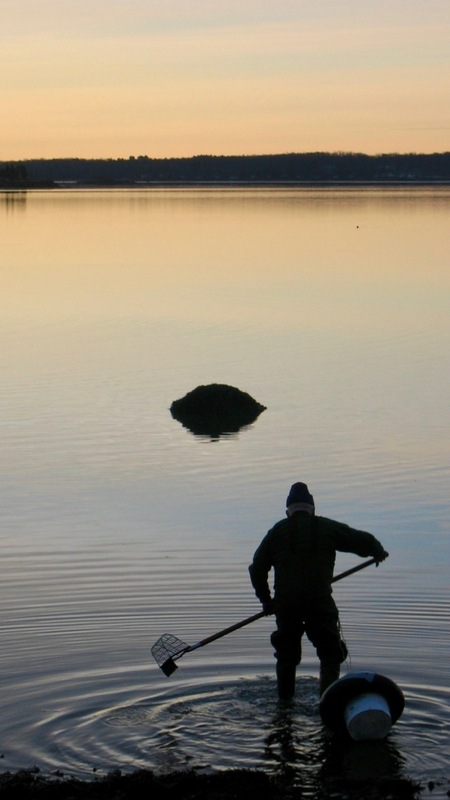 Above: a clammer rakes the bottom of Adams Point in Great Bay, New Hampshire. The frequency and intensity of red tides in the Gulf of Maine are increasing annually. The Northeast Association of Regional Coastal Ocean Observing System (NERACOOS) supports observations and modeling for red tide events throughout the Northeast region. With funds from the OTT project, NERACOOS and GCOOS partnered with Woods Hole Oceanographic Institute and Texas A&M to deploy Imaging Flow Cytobot’s (IFCB) to address this growing concern. The project team is currently working on an alert system for coastal managers. This new alert tool, which will be available in the winter of 2018-2019, allows a manager to create customized alerts based on their individual needs. Users will soon be able to access this information through the NERACOOS ERDDAP server. NERACOOS has also worked with colleagues at NOAA’s National Center for Coastal Ocean Science (NCCOS) to address HAB modeling in the region. In the spring of 2018 NERACOOS and NCCOS co-hosted a two-day workshop to assess modeling and observational needs of the HAB community. The event was well attended by state managers from the U.S. and Canada who shared their experiences monitoring algae blooms and what their needs are to address the growing HAB problem. The workshop identified clear next steps to improving the HAB model in the Northeast, as well as identified key observational gaps. The 2014 HAB that shut down the Toledo water intake was a call to action to expanded monitoring and forecasting capabilities in order to provide managers and other the information they need to make informed decisions. NOAA’s Great Lakes Environmental Research Laboratory (GLERL) and area universities deployed moorings to detect and monitoring algal blooms. Eight drinking water utilities have their own monitoring systems in place, yet six other utilities that relay on Lake Erie as a drinking water source do not. With an OTT grant, the Great Lakes Observing System (GLOS) will work with partners to identify critical monitoring needs that require operational support and will upgrade its data integration and visualization products to provide a Lake Erie HABs Early Warning System to water managers. 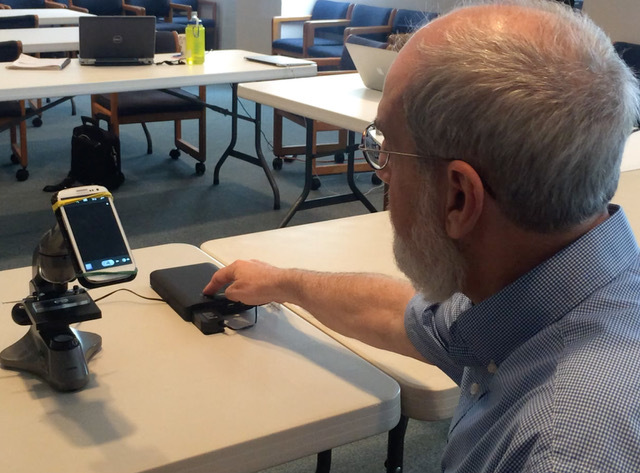 As part of this grant, GLOS partnered with GLERL to bring an ESP to the Great Lakes to enhance detection and assimilation of in-situ, near-real-time toxin measurements into NOAA’s advanced HAB forecasting model (HAB tracker). This information will improve satellite-based forecast accuracy for bloom location, size, and toxicity with 5-day lead time.